This group of moths is now considered to be a separate family, Batrachedridae, rather than a subfamily (Batrachedrinae) of Coleophoridae as designated in the 1983 checklist. Sugisima and Arita (2000) discussed the affiliation of Stathmopoda and Idioglossa and placed the latter genus in Batrachedridae, Subfamily Batrachedrinae, on basis of the key in Hodges (1999). Only a few species of Batrachedridae occur east of the Rocky Mountains. The eight species known from Illinois, however, represent five different genera. The larval biology of Duospina trichella (Fig. 1) is unknown. Two adults of D. trichella have been collected in Illinois, one in early June and the other in late July. Figure 1. Duospina trichella. Adult, collected at light. Four species of Batrachedra are known from Illinois. They all feed on willows, Salix spp., and poplars/aspens, Populus spp. (both genera belonging to the family Salicaceae), and adults sometimes can be collected as they sit on trunks of those trees. Hodges (1966) reported that the larva of Batrachedra praeangusta (Fig. 2) feeds on female catkins and leaf buds of aspen, Populus tremuloides. The adult moth has been collected in Illinois in July and September. Adults of the other Illinois species of Batrachedra are similar in appearance to B. praeangusta but can be reliably diagnosed on male genital morphology. Figure 2. Batrachedra praeangusta. Adult, collected at light. The life history of Chedra pensor (Fig. 3) is unrecorded. Collection of this moth in Illinois was somewhat surprising, as Hodges (1966) recorded it as occurring only in Arizona, whereas a similar species (C. inquisitor) was described from type material collected in central Illinois. These two species of Chedra, although externally similar, are very different on male genital morphology. Figure 3. Chedra pensor. Adult, collected at light, Mason County, Illinois, June. The following two genera, Stathmopoda and Idioglossa, were placed in Oecophoridae (Oecophorinae) in the 1983 checklist. The genus Stathmopoda is represented in North America by two native species, S. aenea and S. elyella, plus one introduced Palearctic species, S. pedella, which feeds on alder, Alnus sp. (Betulaceae). Stathmopoda pedella is not known from Illinois; the comments here refer to the two native species. Both S. aenea and S. elyella are univoltine, with larvae feeding on spores of ferns. In both species, the small yellow larva burrows under the spores on the underside of the pinna and constructs a spore-covered silken web under which it lives and feeds. It also cuts a small hole completely through the pinna to the upper side, where it constructs a small "blister" of silk (likewise covered with spores) as an escape chamber into which it quickly flees in the event of its being disturbed or threatened. The underside silken web may be indicated by a slight disturbance of the spores, but usually it is quite subtle and indistinct in appearance (and therefore not very useful as a searching cue for anyone trying to find larvae). The upperside blister, on the other hand, is conspicuous evidence of the presence of a larva on the host fern. The larva of S. aenea may leave or remain inside the larval feeding web to pupate; that of S. elyella, so far as is known, pupates inside the web (possibly because it feeds on ferns that tend to grow in standing water). When the larva of S. aenea (and possibly also that of S. elyella) enters the prepupal phase, its color changes from yellow to bright vermilion red. In both species, pupation occurs in a double-layered cocoon of dense white silk. Adults of both species are small moths in which the antennal flagellum of the male bears long setae along most of its length. 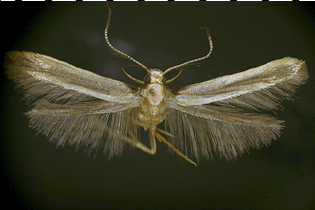 These moths hold the hind legs elevated; this behavior is similar to (although derived independently from) that seen in some other micro-moths, such as Aetole tripunctella, Cycloplasis panicifoliella, and Schreckensteinia spp. (see Family Heliodinidae for coverage of those moths). Stathmopoda aenea (Fig. 4) was originally described from Ohio by Braun (1918), who reported rearing it from two different species of ferns in the family Dryopteridaceae: narrow-leaved spleenwort, Diplazium pycnocarpon (given as Asplenium angustifolium by Braun), and silvery spleenwort, Deparia (formerly Asplenium) acrostichoides. Braun collected larvae of S. aenea in September; larvae left the feeding web to spin and pupate, and the adults emerged during July and August of the following year. Dr. Jean-François Landry, who generously provided the adult specimen shown in Fig. 4, says that S. aenea is common in southern Canada, where he rears it from female fern, Athyrium filix-femina (Dryopteridaceae). There, the adults can be collected by gently sweep-netting the host fern in late June and early July, and mature larvae occur from late August through early September (in agreement with the phenology of Braun's records). Recently, larvae of a moth that appears to be S. aenea were collected in Illinois, at the beginning of June, on Christmas fern, Polystichum acrostichoides (Dryopteridaceae), a plant that favors well-shaded ravines and sloping terrain in deciduous forest. These larvae spun cocoons and pupated in mid-June, and adult emergence occurred the following April. The radical disagreement in life histories between this insect and S. aenea presents an interesting problem. The jury is still out on the exact identity of this moth. Figure 4. Stathmopoda aenea. 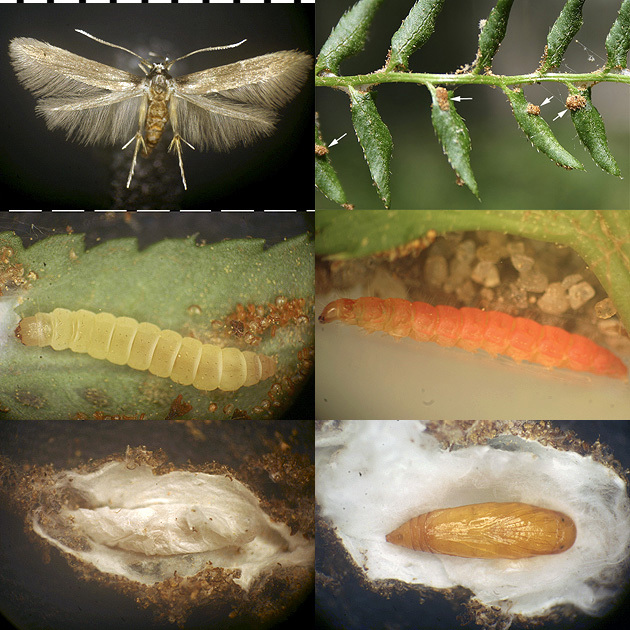 Top row: left, adult; right, larval damage on Christmas fern, Polystichum acrostichoides (Dryopteridaceae), with silken "blisters" on uppersides of multiple pinnae, indicated by arrows; middle row: left, mature larva, exposed by reflecting away the silken feeding web; right, prepupal larva in wandering phase; bottom row: left, cocoon, with outer layer opened to reveal inner cocoon; right, cocoon, with inner layer opened to reveal pupa. Adult specimen provided by Dr. Jean-François Landry, who collected it in southern Canada; immature stages and larval damage collected in central Illinois. Needham (1947) reported rearing Stathmopoda elyella (Fig. 5) from coastal leather fern, Acrostichum aureum (Pteridaceae), which in the USA occurs only along the seacoast of far southern areas (Needham's rearing took place at Englewood, Florida). The moth also occurs in northern North America (e.g., CT, IL). The identity of its larval host in those temperate areas is not known at present. However, James R. Wiker, who collected the two known Illinois specimens of S. elyella (one of which, through Mr. Wiker's generous provision, is shown in Fig. 5), reports that the light at which the two Illinois moths were collected (at a site in Lee County) was immediately adjacent to a wet area that harbors a large stand of crested shield fern, Dryopteris cristata (Dryopteridaceae), with no other fern species being present in the area to any discernible degree, other than a small number of individuals of sensitive fern, Onoclea sensibilis (Dryopteridaceae). The predominance of D. cristata at the site, and the fact that all rearings of native Nearctic Stathmopoda spp. have been from larvae that feed on ferns in which the spores are on the undersides of the pinnae, as in D. cristata (as opposed to ferns in which the spores occur on a separate stalk, as in O. sensibilis) strongly suggest that D. cristata is the larval foodplant of S. elyella in central Illinois. Figure 5. 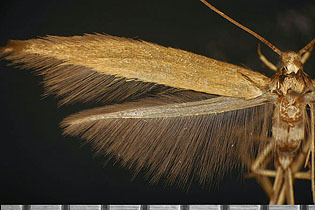 Stathmopoda elyella. Adult, collected at light (Lee County, IL, mid-July, James R. Wiker). Idioglossa miraculosa (Figs. 6, 7) is the only Nearctic representative of this genus. It feeds as a larva (sometimes in very large numbers) on deer-tongue grass, Dicanthelium (formerly Panicum) clandestinum (Poaceae), a plant found in low-lying deciduous forest (especially alongside small stream beds). There are two or three complete generations, with non-wintering larvae present from May through late August, the largest numbers of individuals occurring in the latter month. The feeding damage (Fig. 6A) is distinctive, consisting of a whitish skeletonized patch on either side of the leaf midvein; several larvae may feed on a single leaf. The small yellowish larva (Fig. 6B) lives and feeds on the underside of the leaf, under a frass-laden sheet of silk (Fig. 6C). It also constructs a silken escape tube that runs to the upper side of the leaf through a hole cut through the leaf for this purpose, and the tube is expanded into a small silken sheet on the upperside of the leaf (this sheet is much smaller and whiter than the main sheet on the underside of the leaf). 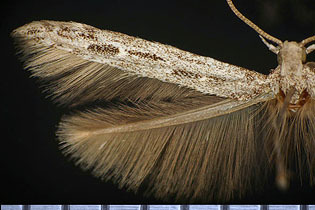 When the larva nears pupation, it constructs two transverse ridges of frass under the main silken sheet, near either of its ends (Fig. 6D). Then it cuts around the perimeter of the sheet and rolls the silk around itself to form a tube (Fig. 6E), which is suspended above the leaf surface by virtue of its being attached at either end to the tops of the two ridges of frass. Pupation occurs inside the silken tube (Fig. 6F). Beginning in September, larvae of the final generation go into wintering mode, in which case formation of the silken tube, and pupation, occur the following spring. The adult is unusual in both its coloration (Fig. 7A), being yellow with metallic fasciae on the hind wings only (our only microlep species to feature this), and also in its very distinctive resting posture (Fig. 7B), in which the wings are held partially spread at a characteristic angle. 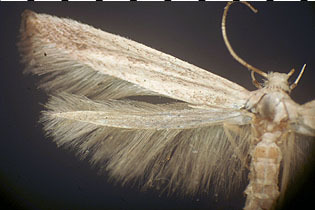 Furthermore, the genus name, which aptly means "unique tongue," refers to the fact that the adult moth has a pair of long maxillary tufts, one on either side of the base of the haustellum (Figs. 7B-C). These tufts are unique to Idioglossa; the tufts and the front legs are extended anteriorly in the live resting adult, as seen in Fig. 7B. Figure 6. Idioglossa miraculosa. Life history. A, plant of deer-tongue grass, Dicanthelium clandestinum (Poaceae) in situ, showing a typical level of leaf damage caused by larvae of I. miraculosa; B, larva of I. miraculosa; C, underside of leaf with main silken sheet, under which the larva spends most of its time; D, lateral aspect of the sheet, with larva (visible at the base of the left-hand ridge) nearing completion of constructing the ridges of frass that will support the pupal tube; E, pupal tube, completed; F, pupal tube with silk reflected open to reveal the pupa and larval exuvium. Figure 7. Idioglossa miraculosa. Adult. A, spread specimen; B, live moth, showing distinctive resting posture; C, head, ventral view, showing the long maxillary tufts.